Rikers Island guards charged: U.S. Attorney says guards conspired to conceal truth about 2012 beating death of inmate Ronald Spear. Inmate Ronald Spear died from injuries sustained at Rikers Island on Dec. 19, 2012. 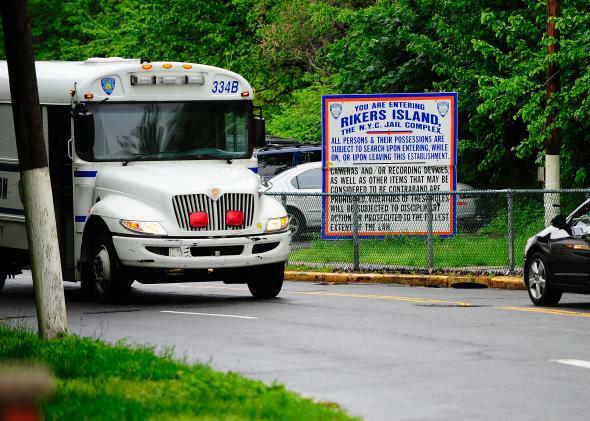 One current guard at Rikers Island and two who have left the jail are facing federal charges relating to the 2012 beating death of inmate Ronald Spear, the New York Times reports. As Officer Coll began kicking Spear in the head, Officer Torres used his hand to try to block Officer Coll, according to the complaint. It says Officer Coll continued to kick the prone inmate, injuring Officer Torres’s wrist in the process. The assault ended, according to the Los Angeles Times, with Coll kneeling over Spear, who was still pinned face-down on the floor. [A]ccording to witnesses cited in the complaint, Coll lifted Spear’s face close to his own. The complaint alleges Coll then dropped Spear’s head, letting it strike the prison floor. Spear stopped breathing shortly afterward. Emergency responders pronounced him dead at the scene, and a coroner said the blunt-force trauma to Spear’s skull was consistent with being kicked. The complaint describes a cover-up that involved numerous officers, a supervisor at the facility, and a fabricated story that Spear had attacked Coll with the Rikers-issued cane he used to walk. Prosecutors also alleged that after the assault, a Rikers captain, who is not named in the complaint, asked another officer to fetch a cane, without explaining why. The officer selected one of the many similar canes that are stored in the unit’s intake area and took it to the captain, who told him to hand it to a correction investigator, the complaint said. The investigator “was told that the cane belonged to Ronald Spear, and had been recovered from the crime scene, although this was not in fact true,” the complaint added. U.S. Attorney Preet Bharara cited Torres’ cooperation with the investigation as key in bringing charges, noting how difficult civil rights cases can be “where a cover-up or code of silence prevails.” The City of New York agreed to a $2.75 million settlement with Spear’s family last year. The charges come less than a week after the news that Kalief Browder, who was held without charges in Rikers for three years—including two in solitary confinement—had committed suicide two years after his release, at the age of 22.